Hello friends! This weeks challenge over on the Simon Says Stamp Monday Challenge Blog is to create something using one or all of the red, white and blue colors. Since it's the 4th of July I used all the colors on the card below. 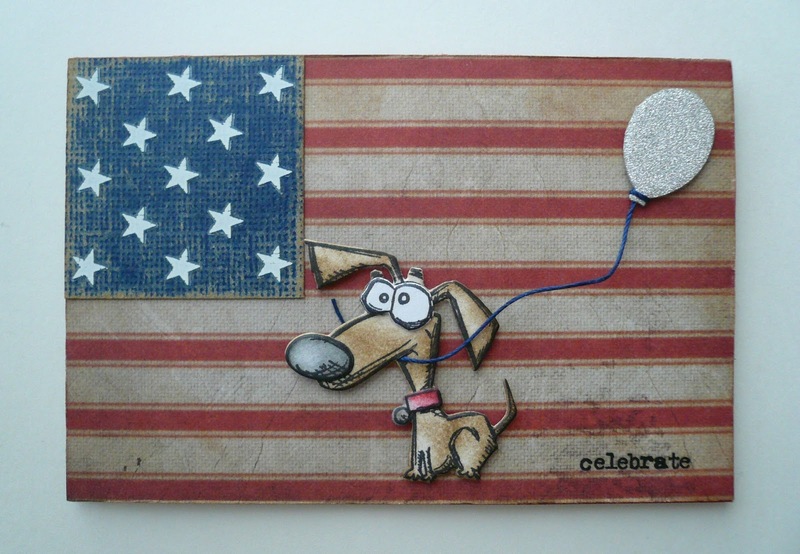 I started by creating a flag to cover the front of my card using Tim Holtz patterned paper, kraft-core cardstock and remnant rubs. Next I stamped the dachshund from the Mini Cats & Dogs set on distress watercolor paper and cut out using the corresponding framelits dies. I colored the images with distress ink and pieced together. My patriotic pup needed a balloon so I cut out a piece of antique silver deco sheet using the Mini Bird Crazy & Things framelits dies and attached a piece of heavy blue craft thread. To finish I added the celebrate remnant rub. So there you have it. Thanks for stopping by and to my friends in the United States, Happy 4th of July! I absolutely love this card! The dog is so cute and the fact that he's holding a balloon is PERFECT!!!! love it!